Fine-art photography is first-and-foremost a visual language by which otherwise hidden truths and meanings - of the world and self - are revealed by the observer / artist. As such, it is rarely the case that what a photograph shows on its surface is the complete "message" that the photographer wishes to communicate. Indeed, philosophically speaking, one can say that fine-art photographers use images to provide glimpses of a reality that lies behind (and beyond) what the images represent, as things-in-themselves. Just as letters and words provide the basic units of grammar for literary artists to communicate essential truths that have nothing to do with letters and words, so too do light and form provide the visual grammar by which photographers reveal fundamental truths of nature (and our relationship with it) that have nothing to do with light and form. Art transforms the abject banality of sterile rules, internalized through years of rote memorization and practice, into an intimate expression of the ineffable. So it should come as no great surprise (though, undoubtedly it will) that the blind - yes, the blind (!) - have much to teach those of us who are sighted about what real "sight" means. 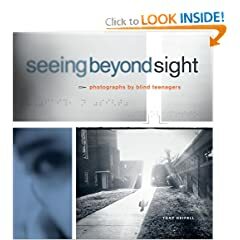 The image at the top of this blog entry is of the cover of an extraordinary book called Seeing Beyond Sight, lovingly put together by visual artist, Tony Deifell, and published by Chronicle Books in 2007. The book collects the works of visually impaired children during a five-year program of teaching photography to students at Governor Morehead School for the Blind in Raleigh, North Carolina, from 1992 to 1997. The book has a dedicated website; and an interview with the author has recently been posted on YouTube. Mr. Deifell quickly addresses the most obvious question: "How can you teach photography to the blind?" On a practical level, even though most of the students involved could not see light, all of them were able to feel the heat due to light. Moreover, blindness does not preclude anyone from achieving a technical understanding of how a camera works, nor of learning the rudiments of good imaging technique. The more difficult question to answer - and what the book so beautifully explains by showing - is "How can the blind take pictures?" In a conventional sense, of course, they cannot; but only if by "taking pictures" we mean using the camera to record what they see visually. However, photography, in its purest form, is so much more than that. But whatever one chooses to call it, the underlying process - for the photographer - is always the same: the camera is merely a mechanical device (and certainly not the only such mechanical device, nor even necessarily the best one to use for this purpose!) that serves to focus our attention (to pressing the shutter) at precisely the right moment when our inner and external experiences align. "I was thinking that it would be sort of hard for a blind person to take pictures, but it's not very hard. You've just got to listen." (John V., student, quoted on page 48 of Seeing Beyond Sight). When the "feel is right" - when everything is in its place, when all the compositional elements have snapped into their positions, the shadows and forms are just where they all must be, and when, for the blind, the warmth of the sunlight on the wall is just so, the wind has quieted down, and is no longer heard, the reverberations of distant footsteps are no longer felt, and the texture of the floor is just the right mix of smooth and rugged against the palm of the hand, then we hit the shutter. In truth, the sighted photographer responds no more to purely visual stimuli than does the blind photographer. All photographers, whether they do so consciously or not (and whether they are aware of it or not) depend on all of their senses to reach that wonderful instant when the shutter goes "click." One can argue that blind photographers, precisely because they do not respond directly to visual stimuli, are actually closer to the core truths and realities that lie beyond the light than photographers who must work their way through to truth (by brute force, so to speak). Anyone can take a picture of a tree; because that is what is in front of the camera. It takes an artist to use the image of the tree to show you something else about the tree, or something else entirely that has nothing do with the tree per se. Since the visually impaired photographer has difficulty seeing the tree as a tree - indeed, the blind photographer does not see a tree at all - other associations and meanings must necessarily arise that, ultimately, result in some inner train of thought / intuition that concludes with the photographer making the camera go click. Just as I consider color a "distraction" to the purity of forms and tonalities I try to reveal with my black and white photographs, I can see how light itself can be a distraction if what I am really after is illumination of what light reveals to me (but which I cannot take a picture of directly). It is a great irony - paradox even (!) - of photography that it so deeply but mechanically depends on something (i.e., light) that is, in fact, rarely the focus of its intended message. Even if the light itself is the message (as exemplified by, say, Galen Rowell's lifelong artistic pursuits), the photograph can only capture the effect that light has on whatever environment the photographer has selected to take a picture in, not the light in situ. There is a touching - or, better, an illuminating - story about a blind student named Leuwynda, who captured a series of wonderful "abstract" photos of cracks in the sidewalk; which she clearly "saw" with her walking cane but which most people are oblivious to. She used her photographs as documentary "proof" of the danger that blind students face in what most would consider uneventfully "short walks" to class, and sent her images along with a letter containing a plea for help to the superintendent. Mr. Deifell muses, on behalf of the rest of us "sighted" photographers, about how many "cracks" there are in the world that we are essentially all blind to? "If the lights are off, I can see what I'm doing." (Dain, student, quoted on page 138 of Seeing Beyond Sight). Another student, Josh, produced some soulful photographs of dark, blurry stairs that he used to communicate - via metaphor - a dream he had about being lost and wandering aimlessly in a snowstorm. Other students started using their growing collections of photographs as a means to develop otherwise under-developed communication skills. Merlett, for example, was both blind and learning disabled, and found reading and writing akin to torture. Photography provided a new - and joyous - language in which she could express herself and, as it turned out, tell all the stories she had always wanted to tell others but could not do so in a conventional way. The book contains a short introduction by the author (and teacher), followed by a selection of student photographs organized into five sections: (1) distortion, (2) refraction, (3) reflection, (4) transparence, and (5) illuminance. It concludes with an afterward, a short FAQ, and a summary of where the students who participated in the project are today. "How do you not cut people's heads off in a photo? Just ask the person where they are." (Frances, student, quoted on page 112 of Seeing Beyond Sight). For me, the book (and the project on which it is based) is a revelation. Were it not for the context in which the images in this book were captured, and the accompanying stories of how individual images came to be, one would be tempted to "dismiss" many of the photographs as "amateurish" and merit-less as fine-art. And that would be sadly unfortunate; for these images go to the heart of human experience and artistic expression. They show us what lies beyond the light that illuminates what we take pictures of, and what all photographers - with and without the gift of sight - are trying to reveal with their photography. Anybody with a decent camera can take a picture of a crack in the sidewalk - and have the image met with blank stares and mutterings of "Yeah, it's a crack in the sidewalk., so what?" It takes a blind photographer to so effortlessly use a physical symbol - i.e., a photograph of some "thing" - to represent the deeper, inner experience of how "difficult it is to walk to class" on a campus built by people who can see. By not being able to see things, the blind photographer naturally focuses on using the things that the camera is able to capture to show what else things are. And that is what the very best photography has always been about. While I have focused mainly on the philosophical end of the spectrum in this short commentary, I would be remiss in not mentioning that I was just as struck about how powerful a general learning tool - about self, about world, about learning (!) - the project was for the students involved. In some ways, though not quite as "obviously" dramatic - the results of the project remind me of Oliver Sacks' Awakenings (though here the "awakenings" are more spiritual than physical). The blind obviously have much to teach us sighted photographers how to really see. They teach us to pay attention to all of the little "invisible cracks" in the world, and to not rely exclusively on our eyes in doing so. There is no better place to begin the first lesson on this journey of illumination - which takes the form of a gentle admonition to just "close your eyes" - than to savor the examples in this magnificent book, Seeing Beyond Sight. Highly recommended. Postscript #1: There is recent evidence that suggests that "blindsight" - i.e., the ability "see" even if completely blind to visual stimuli - is real (and is due to previously unknown ancient evolutionary sensory pathways). See Blind Man Navigates Maze. Postscript #2: A few days after posting my blog entry, I ran across another review of Seeing Beyond Sight very much in the spirit of mine; which is to say, philosophically infused and considerably more about "seeing" than seeing. Postscript #3: There is a similar, but unrelated, book about photography by visually impaired photographers, called Shooting Blind, published by Aperture. An associated website also contains some extraordinarily haunting photographs. It is apparent to me that we are two different creatures: one inside, one outside. It seems also that how we see "inside" is not always connected to how we see "outside". Is it possible to see with our touch? Is it possible to learn to see with our soul (for luck of a better world)? It is obvious that visually impaired people can teach us (seeing people) quite a lesson - spiritual one. Andy, wow. This is great. Thanks for sharing your wonderful insights. I am curious if anyone has any favorite quotes about "seeing"? I've been collecting them. Please share. "We know that the Google story is more than just being about the bottom line. It's about seeing what can be accomplished when we believe in things that are unseen. When we take a measure of our changing times and take action to shape them." Claude Monet: "to see we must forget the name of the things we are looking at." WOW, WOW, WOW this is extraordinary thank you for writing and sharing your thoughts about this book. Thanks so much for this amazing post. This will be my first book of/about photography. This blog was great. It is great when people share their insights about this type of subject. I just discovered your blog while on a lark and am much taken by it. I hope to visit often. We share a love for photography, and though I am no physicist, I like to think (at my limited level) about the makeup of things. This is a treasure. This is my first time visiting your blog and WOW! Love this post! I've always loved to take pictures and the more I take, the more I realize how much I have to learn. This book sounds amazing and the way you described it really makes me want to read it. I know that moment when a shot "feels" right, but have never thought about the feeling of it unsighted. Which I really should. My mom has been losing her vision over the years and for some reason her painting has been improving. And I love your favorite quote. I've been looking for more photography blogs and just bought more memory for my camera, so I'm taking more pictures. I'm seeking to make photography a bigger part of my life. Does that mean that it is seeking me???? You have discovered that the *distinction* between "you" and "your photography" exists more in words than in truth. As you evolve (in art and spirit) you will find other such distinctions (between X and self)dissolving into the mists of time and memory. It’s an interesting, no, fascinating discovery that blind people can take such pictures. That they know of cracks in the sidewalk, where people’s heads are, and how to photograph, are amazing feats. It is truly wondrous and miraculous. Is it so hard to believe that the blind can take beautiful pictures? Perhaps. But, may be not. Let’s explore our senses and see what we might find. There is a current view in physics that the universe is a computer. This view holds that information is conserved and that it cannot be destroyed. What is information? Well, let us posit that information is a description of the universe, or of a part of that universe that we are experiencing at a specific place and time. There may be more to it, but clearly this is part of information of the universe. We experience the universe through our senses: seeing, hearing, taste, smell, touch. Instead of calling them senses, let’s call them sensors. Our sensors don’t so much sense the universe as they measure the universe. When we drink tea, our mouths measure the temperature, either hot tea or ice tea. Our taste buds measure the sweetness. When we look we measure objects in our view for shape, color, and position relative to other objects in our field of view. Thus, seeing is really an act of measuring. Some of our senses have a higher resolution than others; we can hear a wide range of amplitudes, see an extremely diverse set of colors, but we cannot discern different tastes so well. From our measurements we derive a sense of our universe. How do we derive that sense? Our brain. Our own internal, massively connected, computer. Our brains take measurements from our sensors and use those measurements to make sense of our universe. Our brains integrate our sight with our hearing, with our smell, with every sensor we have to describe our world. For example, we can easily recognize smoke in the kitchen from a pot that’s on fire. We see the flames, see the smoke, hear the crackle, and smell the burn and feel the heat. We know where we are and our brains deduce a pot on fire. Are our senses limited? In a way, yes, they measure one thing such as sound with our hearing. But that is not a true limitation. Consider a bat. Bats, as you know, emit sound, listen for reflections (echoes) and their brains are able to “see” and easily navigate in the dark of night. Thus hearing can be seeing. Consider next: sonar. Ships send sound waves through the ocean and from these sound waves computers can print maps of the ocean floor. From sounds come pictures. One sensor can be used to produce what another type of sensor would produce. The trick, the key, is the processing. Or, if you like, consider radar. A plane sends electromagnetic radiation to the ground and with special processing, that radiation is transformed to a picture of the ground complete with buildings, foliage, cars, and other objects present. It’s not sight, it’s radar and it’s call SAR: Synthetic Aperture Radar. With those ideas in mind, let’s consider this book. The blind taking pictures. Far fetched? I should think not. Inside each of these creative and inventive people is a brain, a processor. This processor can take all sorts of measurements and with the proper program, call it training, give the user (that person) a sense of his surroundings. Hence, the beautiful story of the girl who “sees” cracks in the sidewalk with her stick. Her vision fails her but her brain is undeterred and processes measurements of touch to give her a sense of the ground beneath her feet. Our bodies are fascinating and marvelous. What can we learn from this beyond the lovely pictures and, possibly, what more one can do with a camera? I am no great photographer like my bowling buddy. However, I submit we all can learn to use our sensors in new ways that we are not now trained to do. And with that we can draw new beauty, and new visions, from the universe around us. This is a very interesting concept. I found the whole idea fascinating and the idea that photography can be taken to completely another level opens up an exciting and invigorating new paradigm. I will certainly take some time to look at this book. I am an enthusiastic (though not very successful) photographer and have strived to improve for years -I have simply been laboring under the erroneous mainstream conception of photography. This opens up a whole new world! This is a compelling post. I think ever since Helen Keller and her story came to the public consciousness, the wondering about our abilities to communicate with our environment has been greatly expanded. A dear friend of mine,Nan Mac, who is also an exceptional photographer, authored a beautiful book with her handicapped son that illustrates some of the differences visually challenged people face. They both are remarkable people, and their story is a testament to courage.